This guide provides an introduction to the 2.x Programmable Video Android SDK and a set of guidelines to migrate an application from 1.x to 2.x. The Video SDK defines a set of objects that represent a multi-party exchange of media. These objects fall into two types of models: Room model and Media model. In Programmable Video 1.x the Room model was comprised of a Room, a LocalParticipant, and one or more Participant(s). 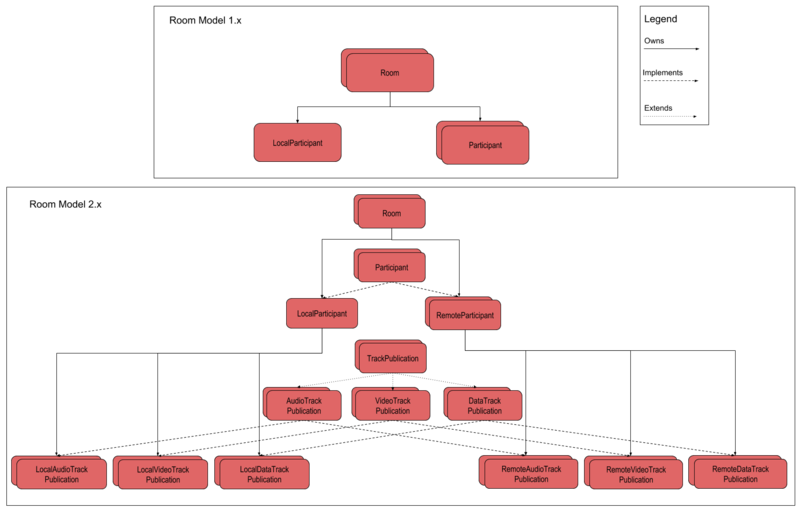 Starting with Programmable Video 2.x, the Room model is now comprised of a Room, a LocalParticipant, and one or more RemoteParticipant(s). The LocalParticipant and RemoteParticipant(s) implement a Participant interface. TrackPublication(s) represent the tracks available in a Room comprised of media from LocalParticipant and RemoteParticipant(s). LocalTrackPublication(s) are available via LocalParticipant and RemoteTrackPublication(s) are available via RemoteParticipant. 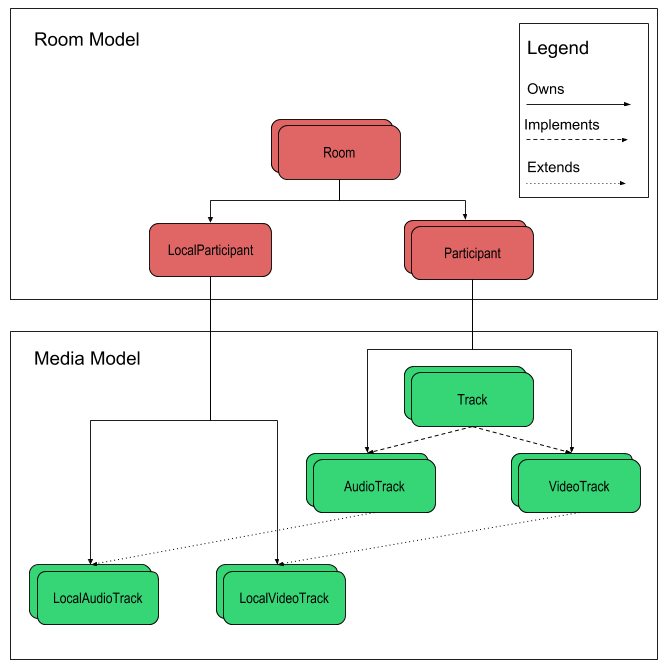 The following graph visualizes the Room model updates from 1.x to 2.x. The following graph visualizes the Media model updates from 1.x to 2.x. 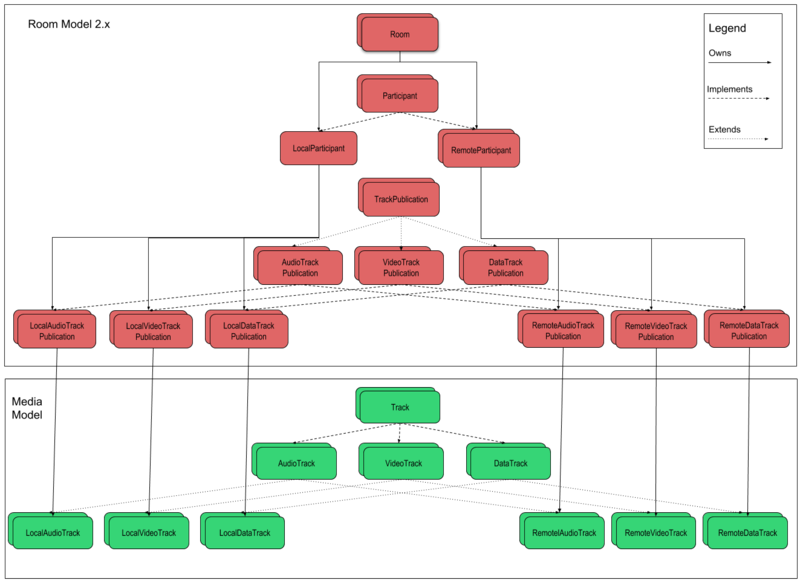 The following diagrams define all objects and their relationships in the 1.x and 2.x Video SDK. This section provides a set of guidelines to migrate an application from Programmable Video Android SDK 1.x to 2.x. Participant events moved from Participant.Listener to RemoteParticipant.Listener. To receive RemoteParticipant events invoke setListener with an implementation of RemoteParticipant.Listener. Reference the API docs for more information on RemoteParticipant.Listener. In Programmable Video 1.x, applications manage media shared by participants when tracks are added or removed. Starting with Programmable Video 2.x, applications should manage media when tracks are subscribed or unsubscribed. Rendering video when a participant shares a video track provides an example of logic that will need to be updated when migrating to 2.x. In 1.x an application receives onVideoTrackAdded or onVideoTrackRemoved event to render or remove the video track from the UI. 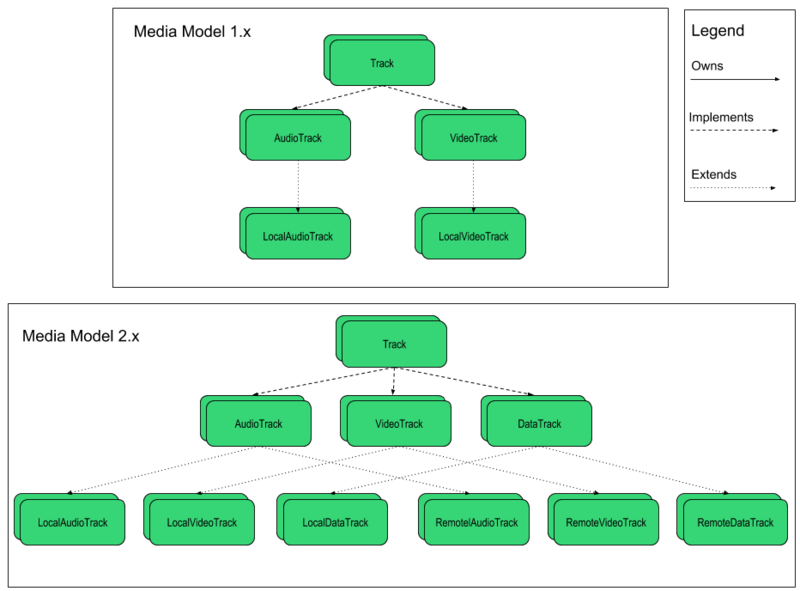 In 2.x applications should use onVideoTrackSubscribed and onVideoTrackUnsubscribed to perform video rendering logic.